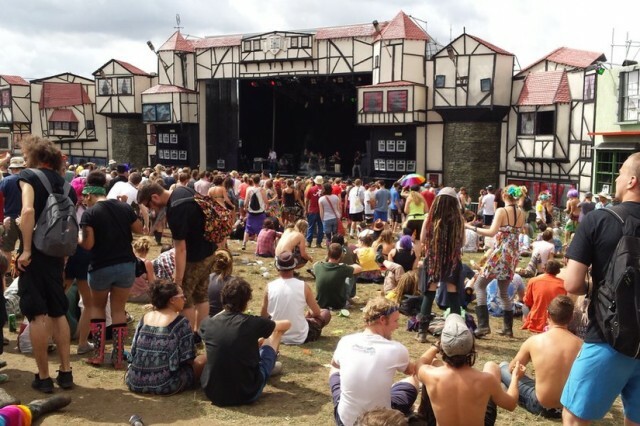 Boomtown Fair concluded the seventh chapter of its journey so far last weekend. 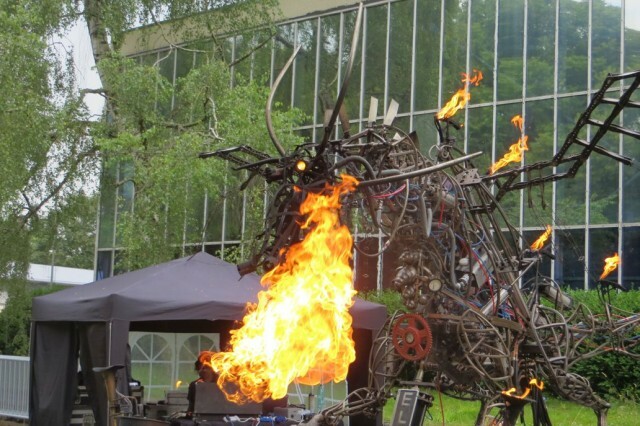 It featured nine districts, 22 stages, a plethora of street performers, actors, and art installations littered throughout the site. 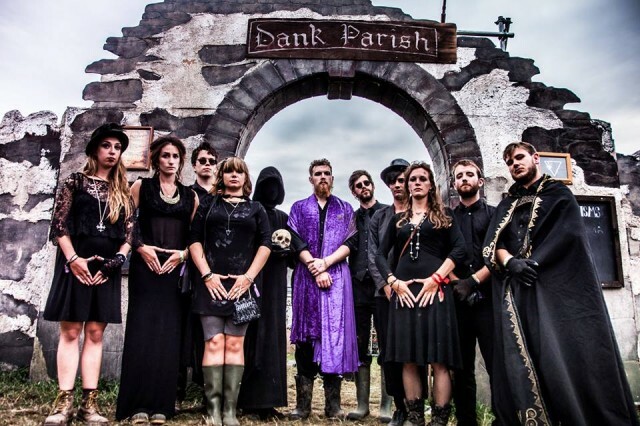 The Winchester festival’s line-up was one of the most eclectic of the UK festival circuit, and the crowd were thousands of the quirkiest, most colorful and creative individuals letting their hair down (or rather dreads, in many cases), and losing themselves in a trippy fantasy world. 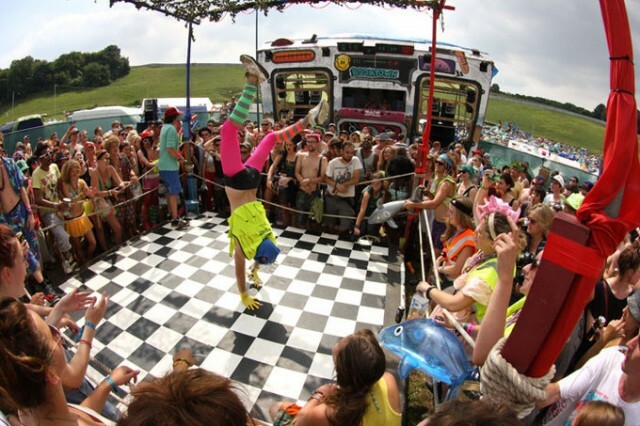 Every festival needs to be policed. It’s a good job the Boomtown Bobbies – actors at their most mental – are always on hand, should anything get out of control. 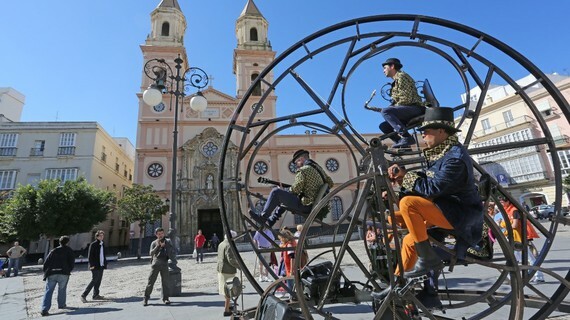 Imagine a four-metre high circular structure with three inter-turning wheels, each containing a live jazz-rock musician. 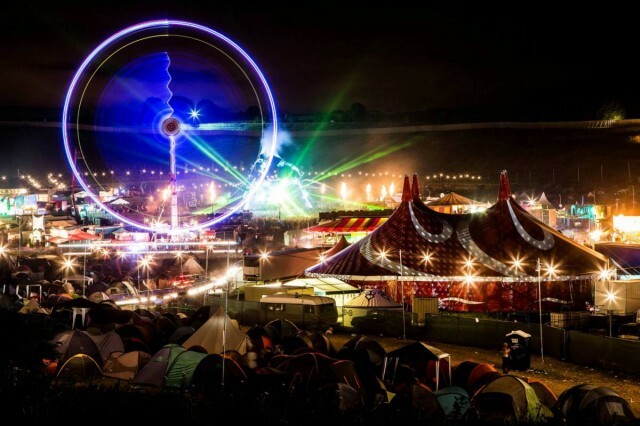 No you’ve not gone mad, you’re just at Boomtown. Are they a band, a hip hop act, or a collective of circus performers? Who knows, but they are great fun! 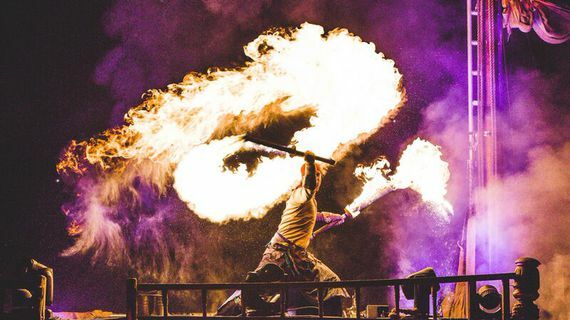 Citizens of Boomtown were given the chance to operate this jaw-dropping piece of fantasy flame-throwing machinery. Imagine being laid to rest in a coffin, carried through the church – among grieving, inconsolable women clutching tissues and flowers – before being slowly lowered six-feet underground. The priest mutters a prayer, lights some incense, then blesses you, and your final chapter is concluded. That’s what goes on in The Church of the Sturdy Virgin. If that’s not your thing you could just get a blessing from the nun – ‘may your hymen remain in tact/your banjo string never snap’. Indeed! 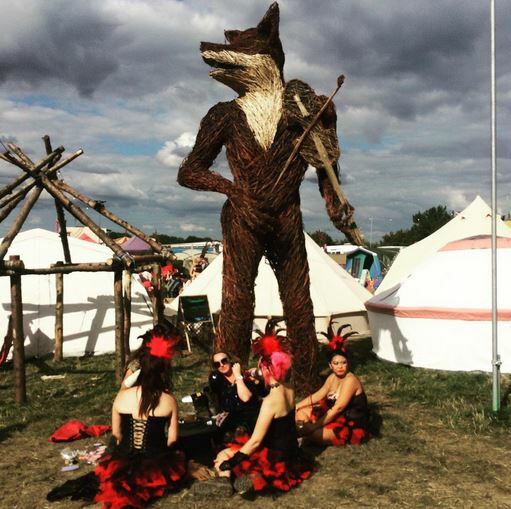 Art installations, like this amazing fox playing a violin, are plastered all around the site. As if your mind wasn’t contorted enough at this point. Where you need to go to witness some crazy shapes being thrown, and some of the most garish fancy dress you’re ever likely to see. An aquarium on four wheels, complete with a mad scuba driver (har, har) who has a penchant for soaking people with water. Look out for the Charlie Brown crew, who look like they’ve been lifted straight from The Great Gatsby. If you find the secret door and say the right things they might just allow you to travel back to the time of US prohibition and access their secret, underground and highly ‘illegal’ speakeasy. Feeling a bit unkempt? 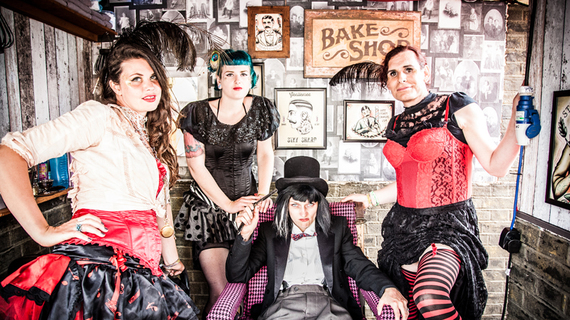 Drop by Jack the Clipper, he and his crew of edgy barbers and scantily clad assistants have got your back (and sides). Need to get the Postie Posse to hand deliver a letter to your friend who is lay in their tent lagging? Or take the loyalty test to demonstrate your allegiance to supreme leader Comrade Jose? Or maybe you just want to hear Goldie Looking Chain rap about their love of 70s muffs. It all goes on in The Town Centre. ‘Sing, Dance and Get Naked’. Enough said. 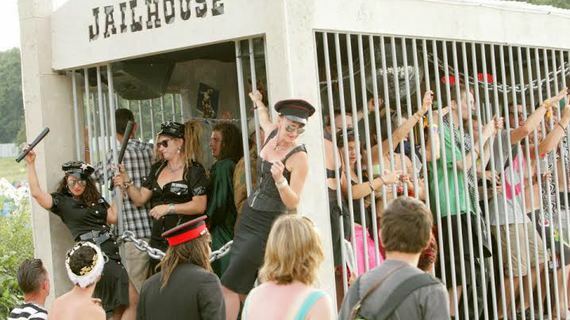 Make sure you behave yourself at Boomtown. If you don’t you’ll be thrown into The Jailhouse and paraded around town. Could they possibly top this next year? I guess we’ll just have to wait and see.